Learn about other Moringa tree species! There are about 13 Moringa species. All trees that grow in tropical and sub-tropical climates. Moringa Species tolerate most soil types and grow well in full sun. Here are a few photos of Moringa trees species, mostly from parts of Africa! Info found from other web sources, links are listed. Grows extremely fast. Has bloated bright white trunks, Moringa drouhardii comes from southern Malagasy dry forest. The trunks hold alot of water. The Moringa drouhardii is used medicinally. The bark and trunks of the tress are used for treatment of colds and coughs by the tribal people. Moringa Stenopetala quickly produces a large gray trunks, producing many edible leaves. and other Medicinal uses in the bark and other parts. Origin Ethiopia, Kenya and Somalia. 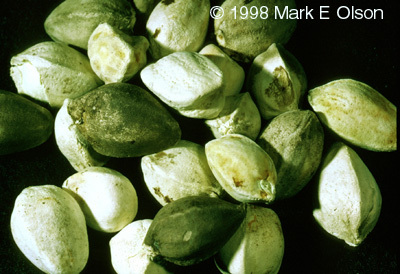 Moringa Stenopetala seeds with/cream color. The bark and trunks of the tress are used for treatment of colds and coughs by the tribal people. Mature Hildebrandt's Moringa grows to over 45 feet. Moringa Ovalifolia "aka Ghost Tree"
From Namibia, South Western Angola, One of the strangest, and most spectacular trees in the highlands of Namibia is perhaps the African moringa, (Moringa ovalifolia) many have a ghostly look appearance. Which grow tall and slender in size. found in the North-Eastern Africa Ethiopia, Eritrea, Djibouti, Israel, Jordan, Somalia, Sudan, Syria, Yemen and some in Iran and Pakistan (mild-east). Use as one of the most important oils in ancient Africa/ Egyptian times. The saplings are roasted and eaten.Use Medicinal Infusion, tincture, capsule and cream. 4-12 months before they seed. From southeastern Pakistan almost to the southern tip of India. Uses: one of the important medicinal plants. Moringa concanensis flowers and leaves! Moringa short tree shrub, bush, herb family! These grow small short, thin of leaves or no leaves. Native to southern Lake Turkana to Mandera District in Kenya and throughout southeastern Ethiopia. Moringa arborea is a species of flowering plant in the Moringa ceae family that is endemic to Kenya . Grow erect, unlike any those of any other species of Moringa. Native to Qardho, Somalia Very very rare. 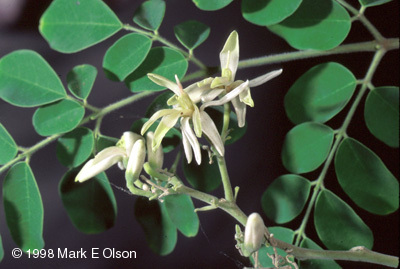 Moringa longituba from northeastern Kenya, southeastern Ethiopia, and much of Somalia. Uses: Medicinal particularly for treating intestinal disorders of camels and goats. The root is given internally. Moringa oleifera, Moringa stenopetala, Moringa. Concanensis and Moringa. peregrina.